“Abortion is so 1973. Welcome to 2019,” Unplanned actress Ashley Bratcher said in response to Alyssa Milano’s Georgia heartbeat bill protest. 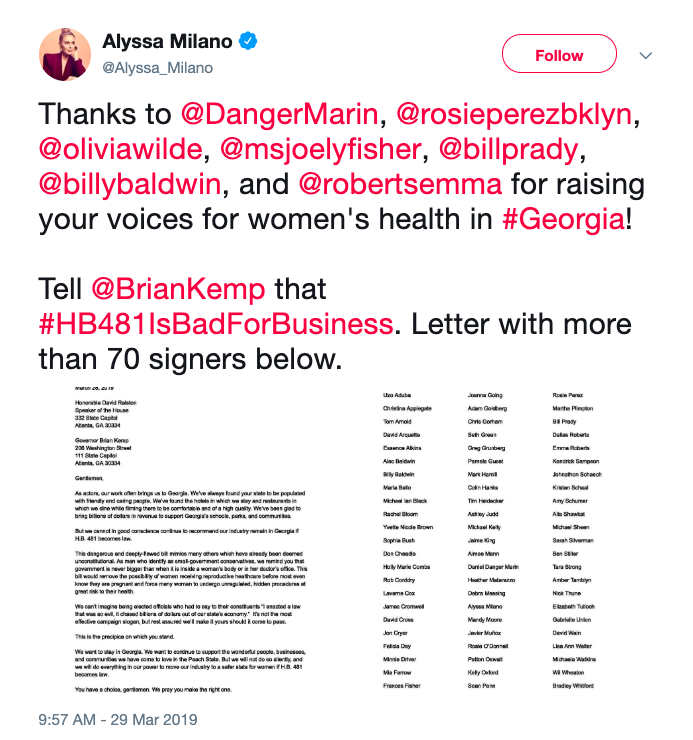 Alyssa Milano recently posted a letter to Twitter, which she will mail to Georgia Gov. Brian Kemp and Georgia House Speaker David Ralston. The letter protests House Bill 481, known as the Living Infants Fairness and Equality (LIFE) Act, or the “Heartbeat Bill,” banning abortions after about six weeks. Hollywood productions are often filmed in Georgia, including those by Netflix and Marvel Entertainment. Milano, along with more than 70 Hollywood celebrities, threatened “to do everything in our power to move our industry to a safer state for women,” if Gov. Kemp signs the bill. Christina Applegate, David Arquette, Gabrielle Union, Mark Hamill, Ashley Judd, Mandy Moore, Rosie O’Donnell, Ben Stiller, Amy Schumer, and several others were among those who signed the letter. 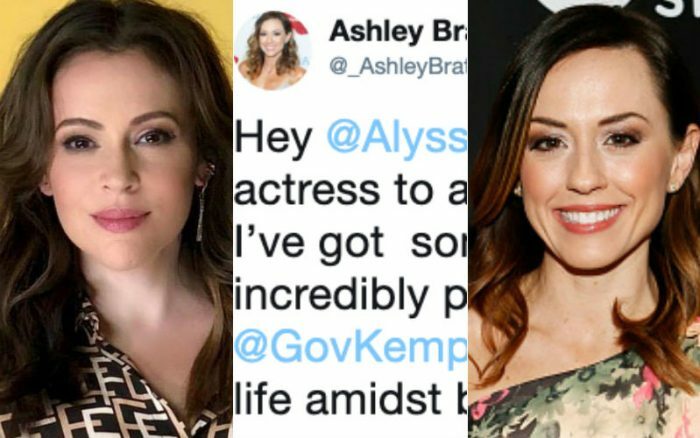 Unplanned actress Ashley Bratcher responded to Alyssa Milano in a Deadline column. Bratcher began, “Dear Alyssa Milano, Mother to mother, actress to actress, and as a proud Georgian, I’ve got some things to say to you. She continued, “With radical laws like the ones in New York and Vermont being passed, it’s more critical than ever that we are using our voices to fight for the rights of women. “One problem, you’re forgetting about the rights of women within the womb. If feminism is all about equal rights, then where are her rights? “I can’t help but think how you would feel in my shoes. Having just learned months ago that my life was spared on an abortion table, it definitely put a few things in perspective for me. “Over 61 million lives never reached their full potential. How many doctors, scientists, philosophers, and even actors like you and me, never had the chance to leave their beautiful marks on the world? Bratcher goes on to say, “Alyssa, let me make something very clear to you. In Georgia, we care just as much about being pro-life as being pro-film. “Our brave leaders have stepped up to say enough is enough, we will no longer sit idly by as innocent lives are taken by the thousands each day. “If you fault Georgia for choosing to be morally correct over politically correct, then that says more of your personal agenda than the goal of our governor to protect life, liberty and the pursuit of happiness for all. “You claim that the HB481 “Heartbill Bill” would make Georgia the most regressive state in the country; I couldn’t disagree more. “Abortion is so 1973. Welcome to 2019, a time in which medical advances preserve the life of babies born as early as 21 weeks. “In case you didn’t know, that’s three weeks earlier than what most states in the U.S. consider ‘viable’ in their abortion legislation. “You want a working environment that is safe, respectful, tolerant and full of love? I know a place just like that and I call it home. “You hail Georgia as the “Hollywood of the South” but you should know, it’s pretty evident that Georgia has its own identity and that it won’t be bowing down to Hollywood anytime soon. The glitz and glamour has lost its appeal and America is watching. “How sad it is that tax credits are a more important topic than the sanctity of human life.